I wrote a post about the video already, but Casper Hulshof did the big job of analyzing the whole thing. I reposted the post here with his permission. It’s really not difficult to criticize schools. Just pointing at anything that happens in schools and then stating something like: “That sure looks old, why hasn’t it changed?” is enough, really. You might want to add: “Does this [random thing in school] adequately prepare students for the future?” Since nobody knows the answer to such a rhetorical question, the answer might as well be: no. The TED talks with the most views and likes are about exactly this, the most famous of which are the talks by Sir Ken Robinson. I analysed those a few years ago. What struck me most about these talks was the use of many rhetorical devices to get the point across. When you remove all those elements, what you are left with is a fairly bland argument about, for example, the lack of attention to particular talents in schools. Hold the revolution. In my view, talks like this make people believe that everything is wrong in education, and that therefore everything should change. To someone like me, who knows a thing or two about educational research, this never ceases to irritate. To a teacher, it must be even more annoying to be put in one’s place by someone who is usually far removed from the field of education. In any case, if everything is so wrong in education, it sure is a miracle most of us have turned out to be fairly successful in life. Still, Ken Robinson is very popular. His ideas certainly touch a nerve. Criticism of the school system is probably as old as the school system itself. Undoubtedly, criticism has been a driving force behind many reforms and innovations in teaching and learning. My own work is, to a certain extent, based on criticism of educational practice. Still, I try to approach educational questions from a scientific viewpoint, something that can’t be said for everyone. Some time ago, a video appeared on Youtube with the interesting title: “I just sued the school system!” (in all capitals). It quickly gained over a million views. The video was created by Prince Ea, an American spoken word artist, poet, rapper and filmmaker (wikipedia). If you haven’t yet done so, you might like to watch the video first. To be able to comment on the case Prince Ea makes in this video, first I transcribed the whole movie to focus on the words themselves. The transcript is written below (in italics). I have divided the text into different parts (unrelated to cuts or camera changes in the movie), and my specific comments on the movie are written below each part. So bear with me, and let’s see if I can persuade both you and the presiding judge that Prince Ea is wrong in sueing the school system. Guest post by Helena Taelman: Children influence their teacher’s language! This is the result of a breakfast talk… Dr Helena Taelman discusses some interesting new research on the dynamics of a preschool classroom. In order to battle children’s language delays from early on, teachers of preschool classrooms nowadays often get interaction training (or responsivity education). The purpose of this training is that they learn to facilitate communication with the toddlers, and they learn to give advanced language models. However, the effects of these trainings are often disappointing: teachers implement the techniques at a low rate (e.g. Neuman & Wright, 2010), and children do not always make measurable language progress (e.g. Cabell et al., 2011). A new study by Laura Justice and colleagues takes a new angle at this phenomenon. In a close analysis of teacher-child interaction patterns, they found that the syntactic complexity of a child utterance was mirrored by the syntactic level of the following teacher utterance: if a child used a simple utterance, chances were higher that the teacher responded with a simple utterance. The reversed pattern was also found, but with a somewhat lower incidence: if a teacher used a simple utterance, chances were higher that the child responded with a simple utterance; if a teacher used a complex utterance, chances were higher that the child responded with a complex utterance. This means that children themselves shape the teacher’s communication pattern, a factor that seems to be ignored in teacher-directed language interventions so far. The study makes me think of another recent study by Wright (2012). She found that teachers offered less word explanations in classrooms with mostly low SES children than in classrooms with mostly high SES children. Moreover, if they provided explanations of words, these were less sophisticated words. This fact may again be caused by the children themselves who offered the teachers less/more conversation leads to talk about sophisticated words? The authors of the study suspect that the communication dynamics in a classroom may differ substantially from the communication dynamics at home, where adults might be less intended to mirror children’s level of syntactic complexity. As the researchers do not know how teachers can be taught to overcome the natural tendency to mirror children’s utterances in order to provide more advanced language models, they urge for more research on this topic. This study examined the transactional, utterance-by-utterance dependencies in the syntactic complexity of teachers’ and children’s talk during small-group conversations in preschool classrooms. The sample included 39 teachers and select children in their classroom, which targeted enrollment to children experiencing documentable risk factors. Patterns of sequential dependencies demonstrated a bi-directional interdependence in teachers’ and children’s complex syntactic use, whereby both teachers and children appeared sensitive to each other’s use of complex syntactic forms. Teachers’ use of complex syntax increased the likelihood that children’s adjacent utterance would contain complex syntax; similarly, children’s use of complex or simple syntax increased the likelihood that teachers’ adjacent utterance would mirror their syntactic level. Associations were small to moderately large in strength, but varied across individual classrooms. The findings point to complex, bi-directional relationships underlying the complexity of talk within the classroom language environment. 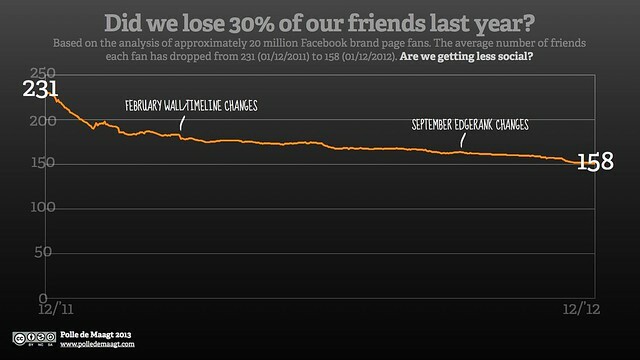 Guest post by Polle de Maagt: Did we lose 30% of our Facebook friends last year? This post is written by Polle de Maagt for his own blog. I asked him if I could share it here with you. His answer was ‘sure!’. I’m a sucker for data and Excel sheets. I just love to spend the night browsing through Facebook Insights export data. As you probably know, you can easily export data on both your posts and pages from Facebook insights (more here). Although even these exports only scratch the surface of what Facebook (and Apple and Google for that matter) have on data, it is a rather rich source for Excel- and data fetisjists like me. As I’m working for a range of clients I can analyse large datasets of approximately 20 million fans. This time, I was digging for data/patterns on the ripple effect of conversations when I stumbled upon something interesting. On December 1st of 2011, the average person liking the pages I researched had 231 friends.That seems to be somewhat consistent with research from Pew Internet and some other sources. Exactly one year later, on December 1st of 2012, the average person liking these pages had 158 friends. That is a decrease of 32%. Are we getting less social? In any case, it is something to take into consideration. It could mean consumers are getting way more strict in their definition of online friendships. It could mean that ‘viral’ campaigns might not be as ‘viral’ as they used to be. It could mean it will be even more difficult to explain your manager why on earth you’re spending so much money on Facebook. Please note: although approximately 20 million brand page fans should give a reasonable idea of what’s happening, the group might always be skewed towards specific geographical areas or interests (they are still brand page fans of specific brands). I would love to hear if you’re seeing similar patterns. Want to calculate what’s happened with your fans? Export your Facebook page insights and open the file in Microsoft Excel. Find Friends of fans (tab 1, column ‘K’) and devide them byTotal number of likes (tab 1, column ‘H’). Drop me a note via twitter or email if you have some interesting results. Last week I did a presentation on myths about GenY and when I checked the rest of the program, something catched my eye: there was also a session on HBDI. is a system that claims to measure and describe thinking preferences in people. It was developed by William “Ned” Herrmann while leading management education at General Electric’s Crotonville facility. Key words : Auditive,logical, factual, critical, technical and quantitative. Preferred activities : collecting data, analysis, understanding how things work, judging ideas based on facts, criteria and logical reasoning. Key words : safekeeping, structured, organized, complexity or detailed, planned. Preferred activities : following directions, detail oriented work, step-by-step problem solving, organization and implementation. Key words : Kinesthetic, emotional, spiritual, sensory, feeling. Preferred activities : listening to and expressing ideas, looking for personal meaning, sensory input, and group interaction. Key words : Visual, holistic, intuitive, innovative, and conceptual. Preferred activities : Looking at the big picture, taking initiative, challenging assumptions, visuals, metaphoric thinking, creative problem solving, long term thinking. OK… but if you read the article on HBDI.com about the theory behind HBDI, you discover that it is influenced by left-right brain thinking. Wait a minute? That is a neuromyth we already discussed. the over 100 scientific articles published on HBDI where all published in… the international brain dominance review. Right, their own journal. The Evidence Based HRM blog tried to find any peer reviewed article, but didn’t find any. Of the 60 doctoral theses, only one can be found and it didn’t get published in any peer reviewed manner. They often mention Nobel Prize winner Roger Sperry but he was not involved at all. Actually, the Dutch Skep-branch checked with many of the mentioned researchers and most of them never were involved. I asked assistant professor Amber Walraven if I could share this blog post with you, she gracefully granted :). We are currently conducting a literature review on Ipads in education (results coming up before summer I hope) and a master final project. In this post I want to talk about the preliminary results of this final project. Imke Boonen (@imkeboonen) is the student conducting this research. The school handed out Ipads to first year students (12 year olds) this year. Their goal is to be a school with an electronic learning environment, no books and all Ipads and apps in about 5 years. Every textbook is available in pdf. Students can take the Ipad home. Teachers received a tech-course (working with the Ipad) and a didactical course. Teachers and school were not very satisfied with the didactical course. School doesn’t make using the Ipad obligatory, but hopes the innovative teachers will inspire the teachers who are a bit sceptic. Furthermore, they would like teachers to use the Ipads to not only teach content but also skills like collaboration. School is curious how teacher’s current practices differ from the ideal way to achieve this. So, our assignment: what is the most effective way to use Ipads in education, and what is the current practice of our teachers? And: how can we best bridge the gap between the two? A literature review concluded that to make the most out of Ipads (and to give room for all the affordances like more differentiation, more visual education, anyplace anytime, and so on), teachers should adopt a social constructivist approach. This implies a different teacher role (from instructor to coach/facilitator) and different assignments for students (more inquiry or problem-based). Armed with an observationscheme focussing on the role of the teacher, 12 teachers were observed. And: surprise surprise….. Many teachers did not use the Ipad, and did not provide students with assignments that required them to use the Ipad in a different way then just reading the pdf of the textbook. Teachers took on the role of the instructor the most. Even the teachers labelled by school as Ipad-experts, did not use the Ipad during the observation. Coincidence? Bad timing of observations? Perhaps… so we interviewed the teachers as well…. Results: some teachers don’t like working with the Ipad, and want to continue the way they had been working before the Ipad. Some teachers just don’t think about switching to constructivism let alone work on collaborative skills, some teachers say children prefer reading the book in stead of on the Ipad, and leave the Ipad at home, and some teachers say they don’t have time to really learn and work with ‘teaching with the Ipad’. So, pretty wide gap between current and envisioned practice! The good news is: if we hadn’t checked this, school would probably go on like this and would conclude after a year that the Ipads didn’t deliver their promise. And that is what often happens, because people focus on the technology, and expect technology to have magical powers. If I add an Ipad, I won’t have to change a thing, and all my problems will be solved. This is just not true! It’s about what you do with the technology, and what you want to achieve, and ADJUSTING ROLES OF STUDENTS AND TEACHERS ACCORDINGLY! Only then can we find out if ICT has an effect on learning, motivation, etc. We can’t just add technology and then conclude it does or does not work. However, new roles and materials require time, effort, commitment, etc. P.s: And to proof my point….. What happens when teachers take time to think about what could be done with the Ipad, to reach a certain goal? They design a very cool tool where students construct knowledge with images. Teacher provides them with a storyline, students search for images and record a voiceover and edit a movie. I hope @Ipadjuf will do more of these lessons and inspire her colleagues! Guest blog by Hanna Lindstrom: are we preparing students enough for internet-related jobs? I received this guest blog by Hanna Lindstrom and I think it’s a good starting point for debate. What do you think? According to Internet World Stats, the number of worldwide Internet users increased by 528.1 percent from 2000 to 2011, and this is something that has caught the attention of both businesses and those wanting a career as a school administrator. The Internet currently constitutes the fastest-growing marketplace in the world. Bearing this in mind, it would seem logical that educational institutions would try to prepare students for Internet-related jobs, giving them the tools they need to be competitive in this ever-growing sector. However, in many ways, educational institutions are not adequately preparing students. In fact, those students who end up becoming Web entrepreneurs tend to do so by taking control of their own education rather than by relying on the establishment. It is the responsibility of educational leadership to adapt methods, materials, and systems of education to help create more Web entrepreneurs and Web-friendly professionals. One way in which educational institutions can help prepare their students a future full of Internet technology is by teaching them coding. Professionals who are skilled in coding languages such as Java, HTML, Python, and Perl are in high demand in many companies. Students who learn these languages can compete for many of the market’s highest paying jobs. Critics argue that technological developments occur so quickly that any language a student may learn would only become obsolete in a few years. Even if this is true, the studies still prepare students by teaching them the basic concepts behind coding and giving them experience. Also, many coding languages do not go away — they simply get updated. HTML, for example, has been around in some form since 1991. While it keeps undergoing revisions and improvements, the basic concepts remain constant. Another very important skill that schools can teach their students is search engine optimization, or SEO. SEO is important because it is the way by which search engines such as Google and Bing decide which pages come up as the top results. Properly optimized pages appear at the beginning of keyed search results. Highly-placed positions are comparable to valuable real estate in traditional commerce. Those who understand SEO know how to get their Web pages — and those of their clients — noticed by Web surfers, and this valuable skill can result in many business and job opportunities. Internet marketing is a fast-growing field. Social media marketing is also a growing field. With the advent of social media services such as Facebook, Twitter, Google+, YouTube, Foursquare, and Pinterest, companies are faced with the prospect of being able to find and engage consumers and clients in new and highly effective ways. However, most educational institutions lack social media-intensive courses. Those who know how to take advantage of these venues often find themselves with a market edge. Creating corporate Facebook pages, posting relevant YouTube videos, and reaching out to potential customers through engaging Twitter feeds can open up entirely new channels of communication, and can drum up business in very efficient ways. The principal purpose of educational institutions is to prepare students for the professional world by giving them marketable skills. For this reason, it is the responsibility of educational institutions everywhere — secondary and postsecondary alike — to do more to prepare students to compete in the Internet marketplace. Even when students’ primary skills are more traditional things such as writing or visual design, by learning Internet-specific skills, they can become more competitive in the very space where all of the action is occurring. Looking forward, most jobs will have some sort of Internet component even if they are far outside the realms of web design and marketing. Schools must take note if our students are to be equipped for life in a truly global landscape.